The ability to measure mechanical properties via scanning probe microscopy (SPM) has been a leading pursuit as the field has developed over the past 20 years. Various measurement methods have been introduced, but the ability to reliably provide unambiguous mechanical property contrast, especially for soft matter such as polymers or polymer containing materials, remains elusive. Phase imaging, in which the difference in the phase between the cantilever drive and response is monitored, is perhaps the most common SPM method to provide contrast due to mechanical properties. However, phase imaging is plagued by well-known artifacts including contrast inversion and phase shift due to multiple mechanical property intricacies, such as adhesion, dissipation and stiffness. Contact resonance (CR) has emerged as a robust method to measure surface mechanical properties, and was recently extended to probe viscoelastic materials1. In contact resonance, the AFM cantilever is in contact with the sample and oscillated with small amplitudes in a direction normal to the substrate. The tip-sample contact can either be actuated through the tip or the sample. 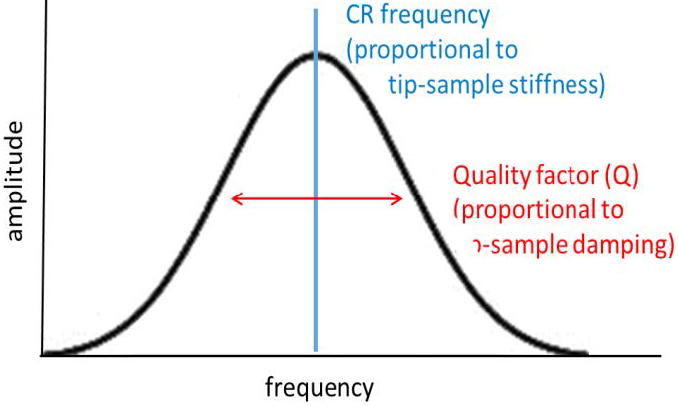 The sensitivity of contrast to surface mechanical properties is based on the principle that the CR frequency and quality factor (Q) will alter in response to changes in tip-sample stiffness and damping (Fig. 1). Thus, if the frequency (blue) and quality factor (red) of the contact resonance peak is monitored over different materials, both stiffness and damping (dissipation) of the material can be monitored. In response to these developments, Anasys Instruments introduced Lorentz Contact Resonance (LCR), whereby the tip-sample contact is actuated by a magnetic field at the end of the probe. 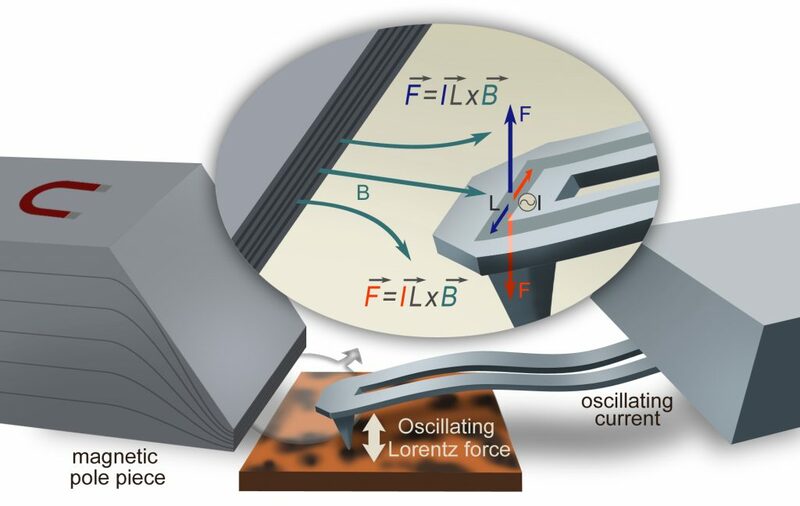 The Lorentz force, the electromagnetic force experienced by a point charge due an external electric field and magnetic field, is at the heart of this technology, and offers several key advantages over conventional contact resonance methods that use piezoelectric actuation to actuate the tip-sample contact. Clean contact resonance spectra. Figure 2 compares a piezo driven CR spectrum (a) with a LCR spectrum (b), where the Lorentz driven tune reveals a clean spectrum with improved signal to noise ratio. Quick broad range sweeps. Frequency sweeps of multiple cantilever flexural and torsional modes at once can now be collected (Fig. 2b), which are easy and fast to measure; a typical 2 MHz sweep of a cantilever takes only 20 seconds. Access to a variety of cantilever motions. The use of Thermalever™ probes with a two-arm cantilever design enable other cantilever motions that are accessible in addition to the conventional flexural modes, including asymmetric flexural and torsional modes, which provide new channels of interaction with surfaces that provide contrast and differentiation. Figure 2. A piezo driven contact resonance tune (a) and Lorentz driven tune (b) showing a clean spectrum with improved signal to noise ratio in the Lorentz tune. The free air first and second flexural modes of a ThermaLever probe are similar to those in a conventional single beam-like cantilever (Fig. 3). 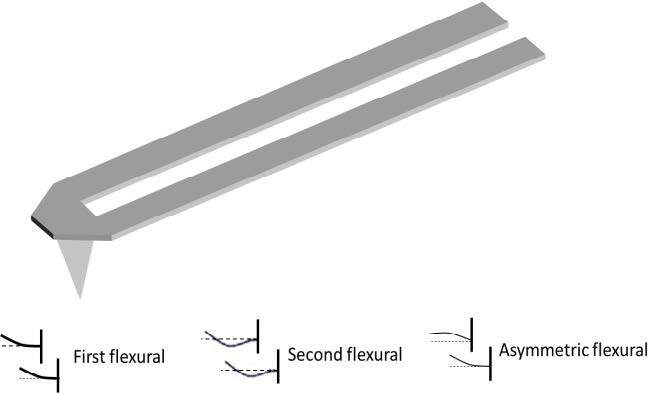 Asymmetric flexural modes result when the left and right arms of the cantilever experience uncoupled motion (bottom diagram). Torsional modes are more measureable coordinated techniques that couple asymmetric bending of the arms with the rocking of the cantilever end. In this note, we describe the application of LCR to successfully rank polymer materials based on their stiffness (elastic) and damping (viscous) properties, and its ability to cleanly and quickly sweep through multiple cantilever modes in order to select the most sensitive modes. In each example, the frequency peak position and quality factor are analyzed to provide a ranking of stiffness and dissipation for each material, and then compared with bulk macroscopic storage and loss moduli (E’ and E” respectively) measured by DMA*. Figure 3. A Thermalever beam in which the two arms can exhibit a variety of motions, resulting in multiple vibrational modes. The different motions of the two arms are shown. LCR was applied to a tri-polymer blend consisting of polypropylene, polyethethylene and polystyrene (60%/20%/20% by weight, respectively), with an AN 200 Thermalever probe (spring constant ~0.5-3 N/m). An AFM image of the blend (Fig. 4b) illustrates that the three materials can be differentiated via their morphology, where PE appears as bright yellow domains, PS in the large round domain to the left, and PP as the matrix material. An LCR spectrum collected on all three materials is also shown (Fig. 4a) with the PP domain are in blue, PS domain in green, and PE domain in red. The LCR spectra show four characteristic peaks where the first (F1) and fourth (F4) peaks at approximately 380 kHz and 1600-1900 kHZ are identified as the first and second flexural mode. The second peak (F2) at 420 kHz is identified as the asymmetric flexural mode, while the third mode (F3) at 800-1050 kHz the torsional mode. Differentiation among the 3 polymer materials is easily observed in the first and second flexural modes (F1 and F4). The asymmetric flexural mode (F2) shows no differentiation, while the main peak of the torsional mode (F3) at 950 kHz also shows little differentiation. The frequency peak position normalized against the first flexural mode (F1) is plotted with the polymer storage modulus in figure 5, and shows excellent differentiation between the three materials in the first and second flexural modes (light blue and dark blue circles). The LCR spectra are compared to the contact resonance spectra with conventional piezo actuation2 that was collected either in a 2-point method3 marked by red triangles, or in a method that collects the whole tune4, marked by orange triangles. Note that the differentiation of polymer materials via LCR shows a marked improvement over contact resonance collected with either of the piezo actuated methods. Furthermore, the other two cantilever modes of torsional (yellow) and asymmetric flexural modes (green) show little sensitivity. The asymmetric flexural mode usually does not involve any tip motion, thus typically minimally sensitive to either vertical, transverse or longitudinal stiffness. The torsional mode does typically exhibit sensitivity to transverse stiffness, in this case demonstrating no substantial differentiation among the three materials with this behavior. Next, the tip-sample damping was analyzed to explore the effects of mode sensitivity on the loss modulus of the polymers, which are inversely proportional to each other. The contact resonance curves were then fit with a damped single harmonic oscillator model to extract the quality factor of each individual mode. Since the calculation of the loss modulus from contact resonance data involves both the frequency and quality factor data, a direct comparison with loss modulus is not possible. Thus, plotted in figure 6 is quality factor against loss modulus, in order to compare the various mode sensitivities. 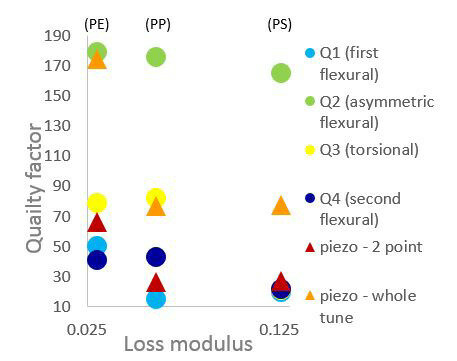 In figure 6, the quality factor of the different modes is compared with the material loss modulus, including the quality factor as measured by the conventional piezo-actuated contact resonance data. The asymmetric flexural (green circle) exhibits poor sensitivity, while the other LCR modes of the first (light blue circle), second flexural (dark blue circle) and the torsional modes (yellow circle) show strong discrimination between the PE and PS. 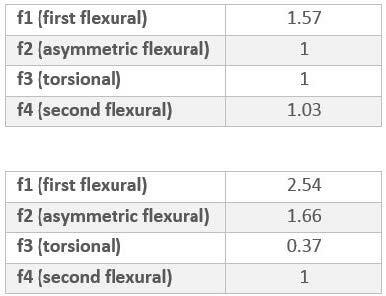 The PP discrimination shows mixed results, in that it has a lower quality factor than the PE in the first flexural mode, but similar quality factor to PE in the second flexural and torsional modes. 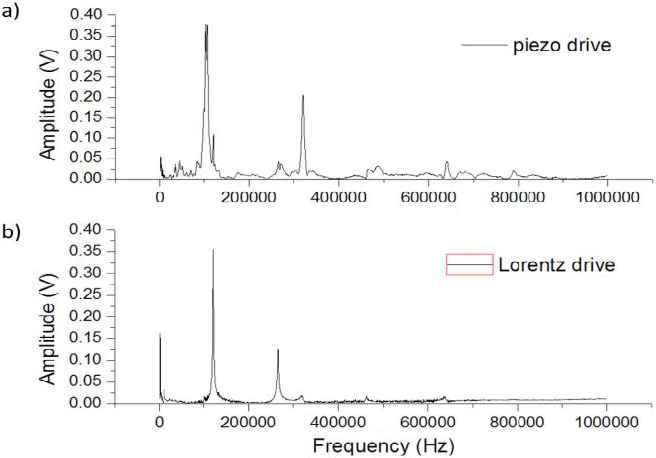 The LCR results show similar sensitivity with the quality factors measured in the piezo actuated contact resonance measurements (red and orange triangles). Figure 4. LCR spectra (a) and AFM height image (b) showing spectra of individual points on the PP matrix in blue, PE in red, and PS in green. Figure 5. 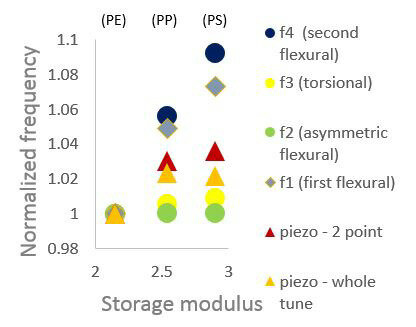 Normalized frequnecy peak positions of the various modes comparing sensitivity to storage modulus of PE, PP, PS. The first and second flexural modes collected by LCR provide the best differentiation of the materials. Figure 6. Quality factor of all modes comparing sensitivity to PP, PE, and PS. LCR measurements on a blend of polypropylene with a brominated poly(isobutylene-co-p-methylstyrene) [BIMS] elastomer were conducted with an AN200 Thermalever probe, with results shown in figure 7. The AFM image of the topography of the blend is shown revealing small <1 μm size domains of elastomer in the PP matrix (Fig. 7b). Collected LCR spectra (Fig. 7a) with measurements on PP (blue points) and elastomer (red points) reveal a variety of spectra features. The peak at 280-400 kHz is identified as the first flexural mode (f1), the sharp peak at 440 kHz (f2) the asymmetric flexural mode, the sharp peak at ~1000 kHz (f3) the torsional mode and the peak at 1600-1800 kHz (f4) the second flexural mode. Several key differences are quickly observed in the LCR spectra between the PP and elastomer. The peaks in the elastomer occur at significantly lower frequencies than their corresponding peaks for the PP, reflecting a significantly lower storage modulus of the elastomer than the PP. 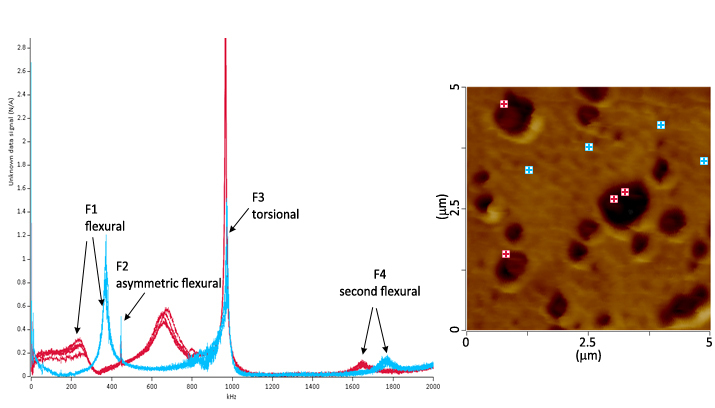 Two arrows identifying the peaks of the elastomer (red spectra) and PP (blue spectra) in each of the first flexural (f1) and second flexural (f4) are pointed out for clarity. In addition, the elastomer, being a severely damped material with a very high loss modulus, exhibits low quality factors in individual peaks with respect to their counterpart peaks in PP. Table 1a shows a comparison in the various modes of the ratio of polypropylene frequency to the elastomer frequency. Similar to the case of the tri-polymer blend, the first flexural (f1) and second flexural (f4) modes displayed the most sensitivity between the two materials, whereas the torsional and asymmetric flexural modes show little sensitivity. Table 1 lists the ratio of PP quality factor to elastomer quality factor for the various modes. This data is related to the damping of the material (loss modulus), and shows excellent sensitivity between the two materials in the first flexural mode and also in the asymmetric flexural mode. Figure 7. LCR spectra (a) and AFM height image (b) showing spectra of individual points on the PP matrix in blue and elastomer domains in red. In this application note, Lorentz Contact Resonance was applied to successfully discriminate in both the stiffness and damping of a thermoplastics blend and an elastomer containing blend. LCR provides a powerful method to reliably compare various viscoelastic material properties with nanoscale spatial resolution, and correlate these properties with structural and topographic features. The frequencies and quality factors of individual LCR spectral peaks can be further analyzed to provide relevant information on the stiffness and damping of the material. Using magnetic actuation provided by LCR, the ability to quickly and cleanly tune through a wide variety of cantilever vibrational modes enables immediate access to multiple avenues for discrimination. These study results show the promise of LCR as a nanoscale characterization method for true differentiation of a variety of material properties. 1. Yuya, P. A.; D.C.Hurley; Turner, J. A., Contact resonance atomic force microscopy for viscoelasticity. Journal of Applied Physics piezo actuation2 2008, 104 (7). 2. Yablon, D. G.; Grabowski, J.; Killgore, J. P.; Hurley, D. C.; Proksch, R.; Tsou, A. H., Quantitative mapping of viscoelastic properties of polyolefin blends with contact resonance atomic force microscopy. Macromolecules 2012, 45 (10), 4363-4370. 3. Gannepalli, A.; Yablon, D. G.; Tsou, A. H.; Proksch, R., Contact Resonance Imaging of Nanoscale Elasticity and Dissipation. Nanotechnology 2011, 22, 355705. 4. Jesse, S.; Kalinin, S. V.; Proksch, R.; Baddorf, A. P.; Rodriguez, B. J., The band excitation method in scanning probe microscopy for rapid mapping of energy dissipation on the nanoscale. Nanotechnology 2007, 18, 435503.